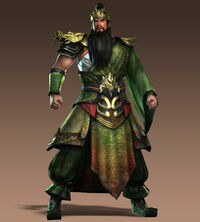 Guan Yu is a powerful general who is considered to be a hero in each kingdom. He meets and joins Liu Bei during the Yellow Turban Rebellion and follows his lord in the Allied Forces. In most titles, he and his brothers duel Lu Bu while at Hu Lao Gate. Following Dong Zhuo's downfall, Guan Yu is eventually separated from his brothers and is often captured by Cao Cao. Momentarily serving his new master until knowing his brother's whereabouts, he decides to repay the kind gift Cao Cao gives him at Guan Du and has special quotes if he cuts down Wen Chou and Yan Liang. If he spots his brother in Yuan Shao's army, Guan Yu will lay down his arms and retreat. Tied by his oath he has to Liu Bei, a few games depict him leaving Cao Cao and journeying through five passes to reunite with his brothers. A few titles also has Guan Yu reinforce Liu Bei's flight at Chang Ban by guarding the boats for their escape. While his brother leads a campaign against Liu Zhang, Guan Yu is left to guard Shu's foothold in Jing Province. Aside from a few select scenarios, he often dies in Jing Province at Fan Castle.